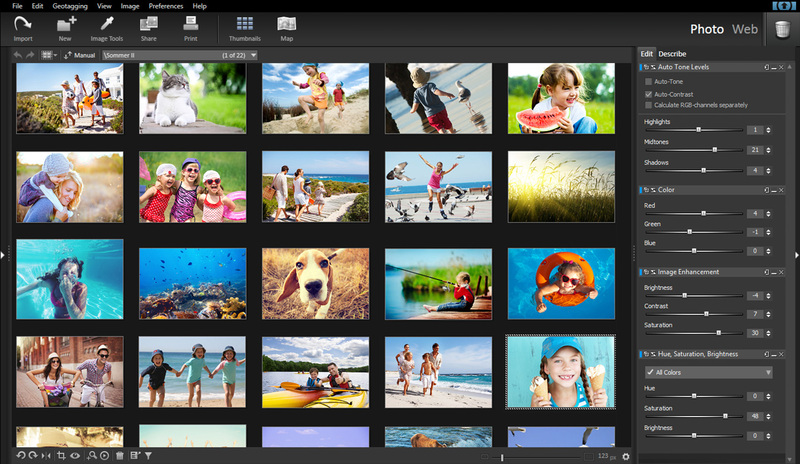 StudioLine Photo Basic 4 is a free image management and editing solution. A load assistant guides you through loading photos from camera, hard disk or other media. Clearly label and categorize each image with unlimited amounts of text in various system and user descriptor fields. The built-in search engine offers quick look-ups as well as expanded searches that can combine search criteria and string sequences. A mouse click can adopt identical image editing steps and settings, as well descriptions and other metadata, to any number of similar images. Original images are maintained unchanged so that edits can be rolled back, even individually, at any time. You can use the Geo Explorer to pinpoint images to the location they were taken. Includes 1 GB of online space for you to share your photos, galleries and slide shows on www.MediaCenter.pro. You control access to your online albums and who may download photos. ArtIcons 5.49: You can create, edit, import, export and find icons and manage icon libraries Icon to Any 3.27: A slim wizard converts Windows icons to images and cursors for use on webpages Fast RM to MP3 Converter 4.2.587: Convert RM, RA, RAM, RMVB, to WAV, MP3, OGG, APE or WMA Smart DVD Creator 15.3: Easily burn quality home movie DVDs, VCDs or SVCDs from popular video formats.